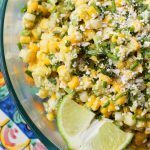 Most of you know that I love my vegetarian meals, so I was really pumped when so many of you requested more veg-friendly recipes! And since the Super Bowl is only a few weeks away, this felt like the perfect time to experiment with something fun. I mean, let’s be real. Most Super Bowl line ups are extremely meat heavy, so why not try to sneak some veggies into the mix?! 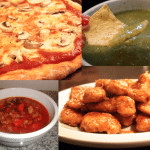 When I think of football, I always think of the typical favorites: chili, pizza, and wings. I’m actually really proud of my chili recipe because it uses ground turkey instead of ground beef – with the option of adding pork sausage if you don’t want it tooooo healthy 😉 And since pizza is perfect exactly as it is (RIGHT?! ), the other favorite dish to tackle is… wings! We actually bake wings for dinner a lot as a weeknight meal with a big salad. They’re easy when you’re making them for just a few people, but I definitely wouldn’t want to be responsible for enough to feed a whole party. 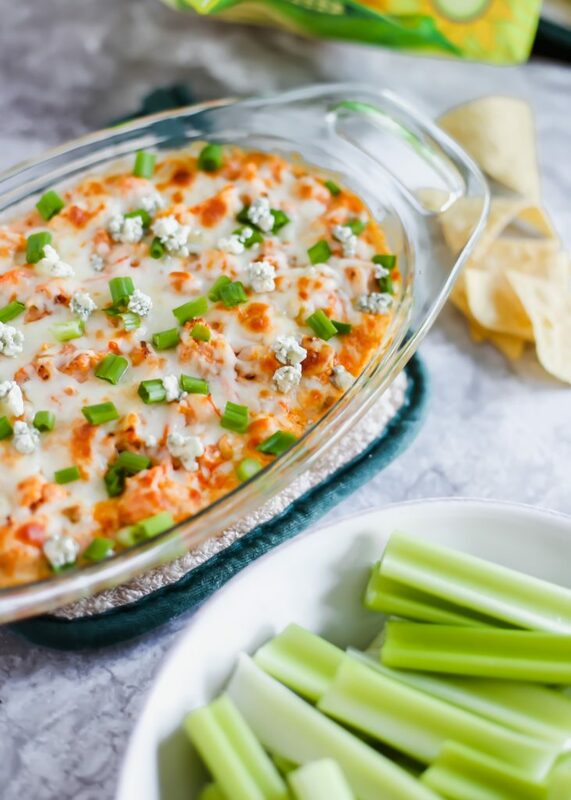 But instead of going straight to buffalo chicken dip… what if everyone could get excited about a healthier buffalo cauliflower dip instead? CHALLENGE ACCEPTED. 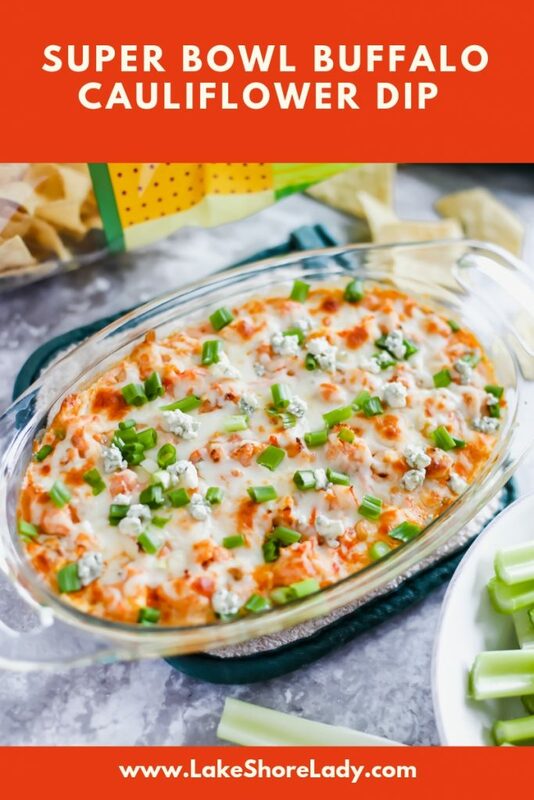 Since a buffalo dip requires a certain amount of cheese, I tried to find other ways to lighten up this vegetarian alternative. Instead of sour cream or mayo, I opted for fat free greek yogurt. That creaminess also allowed me to cut down on the typical amount of cream cheese, too. Big wins! 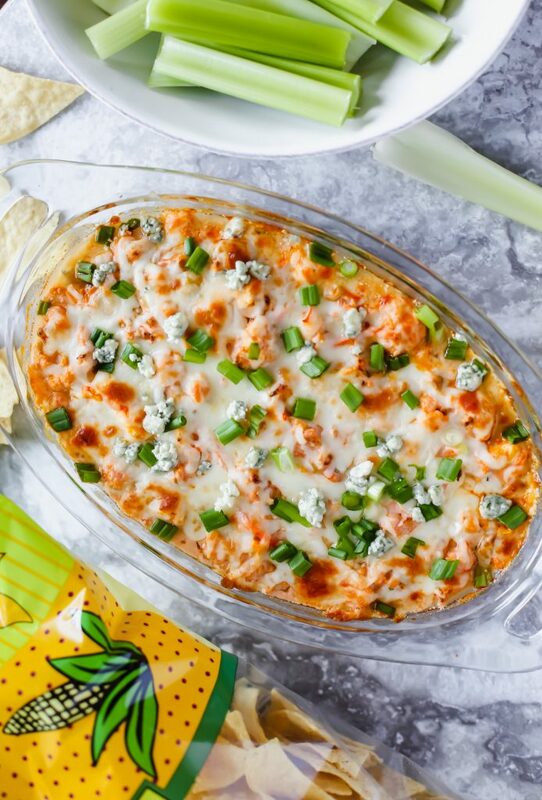 Once it comes out of the oven, sprinkle with a little bit more green onions and blue cheese, and serve with tortilla chips and celery sticks! 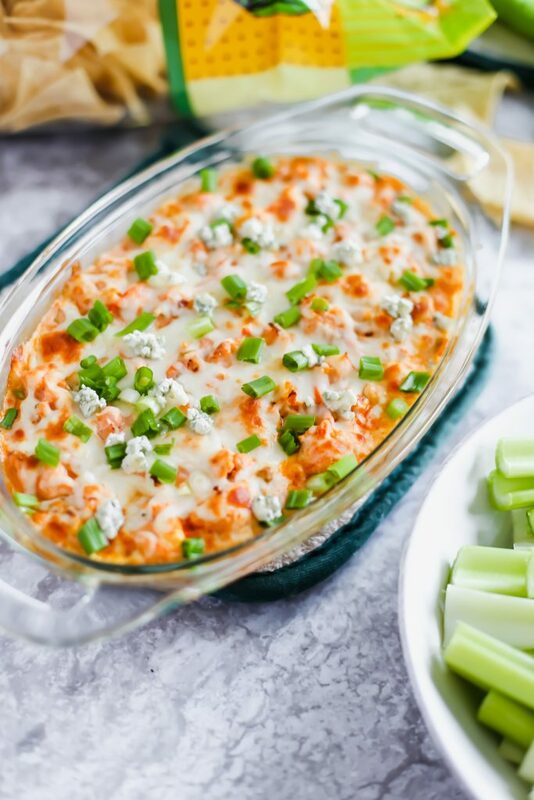 Are you a buffalo chicken purist or would you give this buffalo cauliflower dip a try? 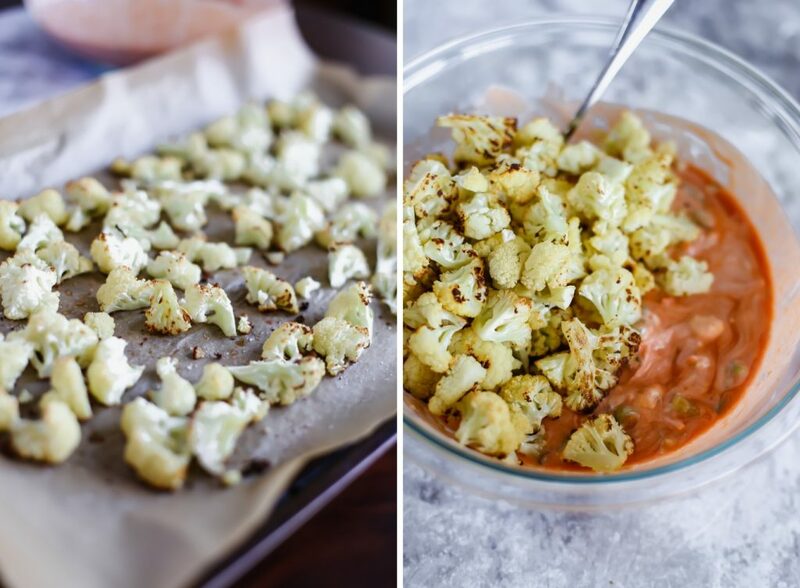 Cut the cauliflower into small florets. Add to lined baking sheet with coconut oil, salt and pepper. Roast for 25 minutes. Lower the heat to 375 degrees. 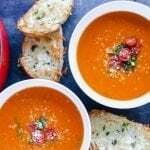 In a medium mixing bowl, combine greek yogurt, hot sauce, blue cheese, shredded mozzarella, green onions, cream cheese, and carrots. 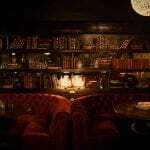 Stir to combine. Add roasted cauliflower and stir until coated. Transfer the mixture to a pyrex baking dish. Top with shredded mozzarella cheese. Increase heat to a Low Broil and broil for 3 minutes. 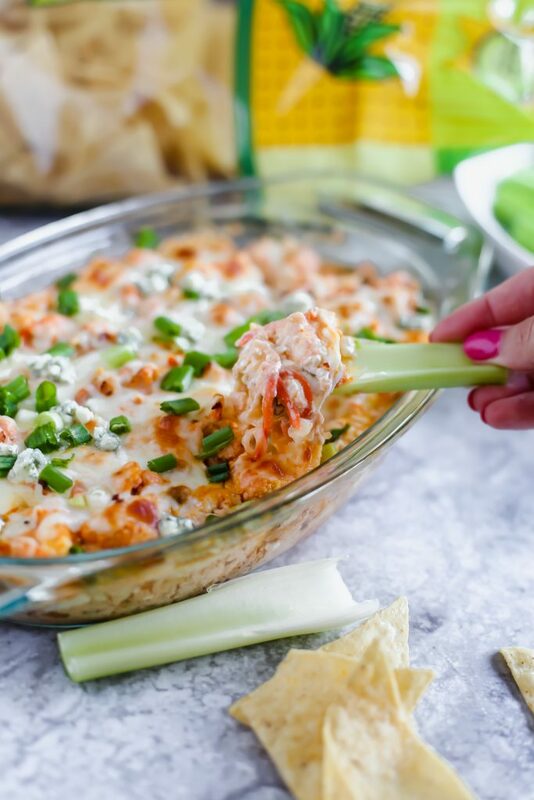 Garnish with more green onions and blue cheese if desired. 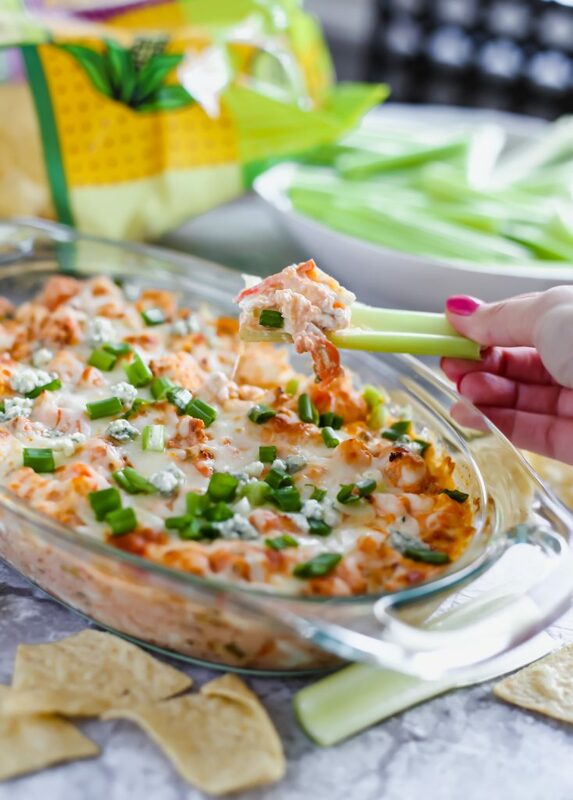 Serve warm with celery and tortilla chips! 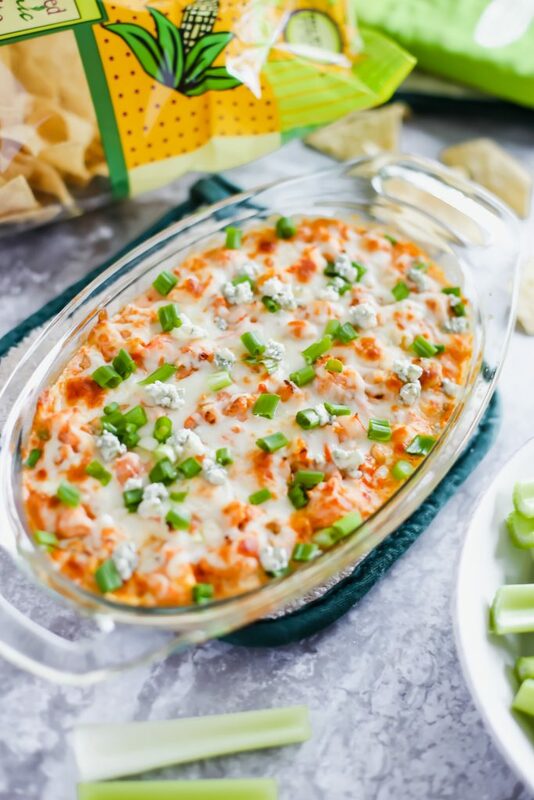 Want to remember this Buffalo Cauliflower Dip recipe? 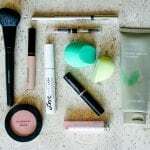 Pin the image below! PS. 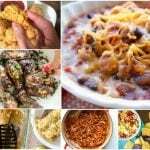 You might also like my Turkey Chili Recipe and Crock Pot Zucchini Lasagna Recipe!